Barring a few purposeful crashes, NASA hasn't landed anything on the moon's surface since the Apollo era. NASA has opened a submission period for commercial moon-lander proposals, noting that selected technology might fly as soon as next year. The call is one of the agency's early steps in its plan to return humans to the moon's surface in the 2020s. That timeline was chosen in part because of the plan NASA has to recruit commercial partnerships to lessen the burden on the agency and its budget. 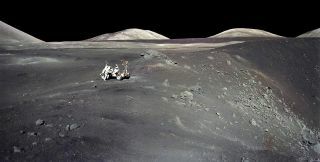 "The strategy is that these early missions will help us prepare for more complex future missions such as searching for useable resources, building up a seismic network to understand the moon's internal structure, and studying the lunar mineralogy and chemistry to understand the moon's origins," Steve Clarke, deputy associate administrator for exploration at NASA, said in a statement. NASA is keeping an open mind as to what precisely those commercial landers will look like, although the agency does want projects that have a scientific or technological focus. "We are looking for ways to not only conduct lunar science but to also use the moon as a science platform to look back at the Earth, observe the sun, or view the vast universe," Clarke said. "In terms of technology, we are interested in those instruments or systems that will help future missions — both human and robotic — explore the moon and feed forward to future Mars missions." In order to be selected, projects must be able to fly no later than December 2021. Proposals are due Nov. 19. But if that deadline is coming up too quickly, don't panic — NASA says it will look for another round of suggestions in about a year.